- Hellboy Goes East: A Revealing look at many of the inspirations, backstories and secrets of Hellboy: Sword of Storms. 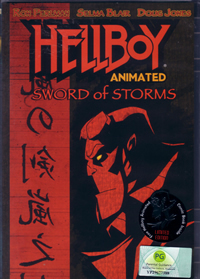 In this first animated feature from Director Tad Stones (Buzz Lightyear of Star Command), and Creative Producers Mike Mignola (creator of Hellboy comics) and Guillermo del Toro (writer/director of the Hellboy movie), a folklore professor becomes unwittingly possessed by the ancient Japanese demons of Thunder and Lightning. But when The Bureau of Paranormal Research & Defense dispatches a team of agents to investigate, a cursed samurai sword sends Hellboy (Ron Perlman) to a supernatural dimension of ghosts, monsters and feudal mayhem. Now while pyrokinetic Liz Sherman (Selma Blair) and fishboy Abe Sapien (Doug Jones) battle one very pissed-off dragon, a lost and cranky Hellboy must find his way home. Even if he can survive the perilous journey, how much crap does a guy have to put up with from the two most vengeful and ferocious spirits of Japanese legend? The first Hellboy movie did modestly at the box-office, good but not good enough to generate a sequel according to Sony who financed it. (Sony later sold the rights to Universal). To begin with, Hellboy is not really a household name, definitely not in the league of Marvel or DC characters such as Batman or Superman so it’s quite a surprise the full-length movie got me hooked at first viewing. Retaining the voices from the movie and the characteristics of the comics, the animation movies feature a sleeker look, very close to the style of Genndy Tartakovsky’s "Samurai Jack"” and what he did to "Clone Wars". In today’s era of CG animation, it’s always nice to see touches of hand-drawn animation. The artwork blends the backgrounds and the characters well together. Most importantly you could feel the essence of the original comics but also the genuine efforts of the production team to give viewers old and new, a fresh experience. "Sword of Storms" involves a professor being possessed by two ancient demons in which the BPRD is sent to investigate. Incorporating some weird Japanese folklore into the story makes it even more enticing. It’s fun seeing Hellboy dealing with flying heads, spider demon, Liz and Abe fighting sea monster and you can’t help thinking what if Del Toro were to translate this to live-action? I had only one gripe about "Sword of Storms". Despite the goodwill attempts by the writers to stretch this movie to 75 minutes, I would have prefer some of the action bits be toned down a little, shrink some of the unnecessary plotting and make this an hour special. It’s nice to see a Hellboy animation movie but it would fare much better as those 30 minutes episodic animation series. If you are a fan of the first movie or a loyal fan of the Mike Mignola’s comics, you should attempt to get “Sword of Storms” DVD. You are in for a treat. To Hell And Back: How Mike Mignola Created Hellboy – A 10 minutes feature which has Hellboy’s original creator Mike Mignola talking about how he came up with the character and it’s history. A New Breed: Creating The New Hellboy – The character of Hellboy is reimagined in the animated movies and this segment talks about how the final design came about. Conquering Hellboy: The Actor's Role – Interviews with the voice actors such as Ron Perlman, Selma Blair, Doug Jones and also peeks at the recording sessions. A View from the Top: The "Heads" Sequence – One of the bizarre sequences in the movie is discussed here. Keepers of Hellboy - A Comic Con 2006 Panel Discussion – An almost 45 minutes recording of the discussion panel at the San Diego Comic Con two years back. Panelists include the conceptual artist, writer, director, Mike Mignola and also creative producer Guillermo del Toro of the animated movies. Audio Commentary Featuring Hellboy Creator Mike Mignola, Supervising Producer/Director Tad Stones and Director Phil Weinstein – If you are keen to know more snippets of the movie, just enable the commentary track and let the creators behind this project overwhelms you with production details. Hellboy Goes East: A Revealing look at many of the inspirations, backstories and secrets of Hellboy: Sword of Storms – This segment discussed how a Japanese folklore inspires the story arc and also interview with the animated movie composer Christopher Drake. This Code 3 DVD comes with the original English audio track and Chinese subtitles only. The Dolby Digital 5.1 doesn’t disappoint with its display of boisterous, sound effects from the various corners and the visual transfer is excellent as well. Colours, shades are deep and strong despite a majority of night scenes.